Growth-Driven Design is a departure from the traditional web design project. It doesn't have a finite start and finish - instead, it focuses on continual improvement using real data to refine and improve your site over time. What's more, if you already practice Inbound Marketing, then you may understand the benefits quickly and see how it plays into your entire sales strategy! Then... most times you walk away and get back to work and for the most part ignore your site for another 2-3 years. 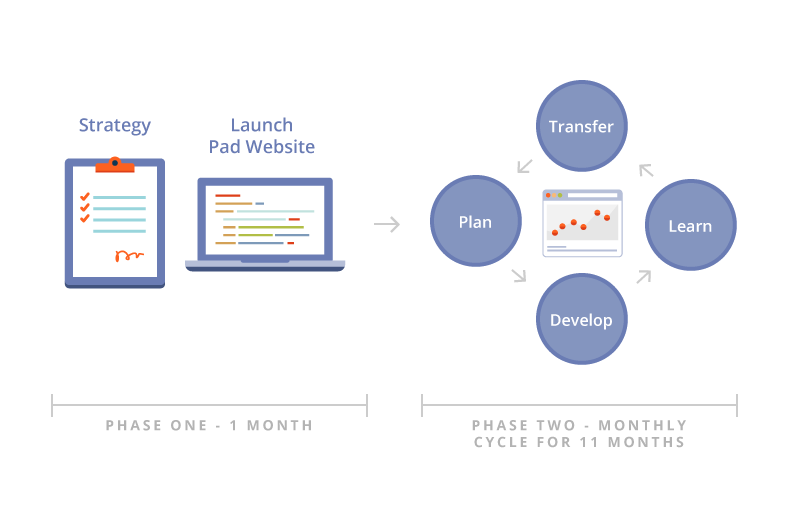 Growth-Driven Design is organic - like your business, marketing, and sales teams. Instead of looking at your website redesign ad a finite project, we look at your website as a living, breathing, sales machine that needs constant data-driven refinement and improvement to increase conversions and leads for your organization. We establish baseline goals and absolute must-haves for your new website. We then enter a cycle of continual improvement, refining the design, calls-to-action, content, messaging, and more - all based on real visitor data. So like a traditional project, you do "relaunch" a new design, but it is usually a smaller undertaking because we know we're going to improve it over time. Growth-Driven Design is particularly exciting because it addresses so many pitfalls in the traditional web design project approach, and also plays perfectly into a company that practices Inbound Marketing because it ties all your efforts together.